SARASOTA COUNTY – With sea turtle nesting season beginning May 1, Sarasota County reminds residents and visitors there are some simple steps they can take to ensure the safety of these unique animals. "Every May through October, our beaches become a crucial habitat for the largest congregation of sea turtles nesting on Florida's Gulf Coast," said Keri Ferenc-Nelson, a wildlife specialist with the Sarasota County Environmental Protection Division. "All species of sea turtles are threatened or endangered, and our federal, state and local regulations can only do so much to protect them. All of us need to do our part." Each night, remove all furniture and recreational items from the beach and store them in an area free of sand and dune vegetation. Properly dispose of trash and discarded fishing gear. Sea turtles ingest plastic bags and wrappers, mistaking them for jellyfish, and they can become entangled in old nets and line. Only use flashlights to safely enter and exit the beach at night. Fishing lanterns should be used only as necessary to set, bait, and remove hooks from fish, and not be illuminated the entire time you are fishing. Conduct a lighting inspection of your property to make sure exterior lighting is minimized and not directly visible from any direction on the beach. Property owners must replace white incandescent, fluorescent and high-intensity lighting with amber or red light-emitting diodes (LED) or low-pressure sodium vapor (LPS) fixtures or yellow, bug-type bulbs. All fixtures emitting light visible from the beach must be shielded or angled so the light is directed down and away from the beach. Each year, thousands of turtle hatchlings die from predation, exhaustion and starvation due to the disorientation caused by bright lights. Have questions or need assistance with adjusting the lighting on your property? 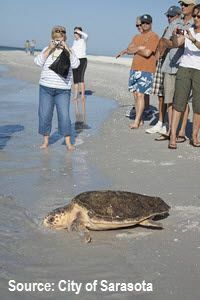 Contact the Sea Turtle Protection Program at 941-861-5000 or visit www.scgov.net and enter the keywords "sea turtle."